This Setup is for dkim-patch >= 1.0 only. For older versions please see here. After installing the plugin the first time, you must define the path for the DKIM keys under “Server Config”. The plugin stores the private and public key in this directory. For security-reasons this can´t be the root-path ‘/’. When creating or editing a mail domain the settings for DKIM are available in “DomainKeys Identified Mail (DKIM)”. The keypair can be created by “Generate DKIM private key” or by inserting an existing private-key with cut & paste. The dns-record is displayed for information only and can not be changed. You can insert this values into an external dns. If you change any DKIM-values (i.e. delimiter or key-pair) ISPConifig updates or creates the DNS-record as long as the corespondig DNS-Zone is active. By default ISPConfig creates a new domain with DKIM enabled. You can change this in the template. You can create the DKIM-record easily by creating a new record called “DKIM”. ISPConfig reads all data for the domain and adds the corresponding data. Add a SPF-Record with the “SPF” Button. 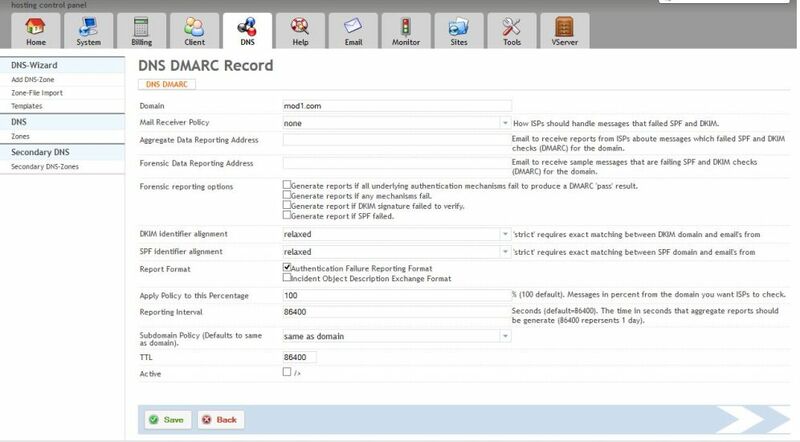 Add a DMARC-Record with the “DMARC” Button. You can always resync your full DKIM-Settings with the resync-tool (it´s recommended to resync DKIM-Keys and DNS Records). If you have already defined DKIM-keys in your amavis-config, you can import them into ISPConfig with script/import_dkim.php. For more informations see the README. Silly question, will this be included in a future ISPConfig release/update? I have 2 setups one with 3.0.5 and the other using whatever latest is. If I upgrade 3.0.5 I should be good to go then. How can I revert back? Can you please provide more info on how to do this please? I would greatly appreciate it. Here’s what I tried doing to revert back. It didn’t revert back is there anything else that I need to do? i’ve success installed DKIM and SPF Record, but it still going to spam in GMAIL can you help me? Ist echt gut, nur ein kleines problem. Der DKIM Eintrag im DNS wird mit einer TTL von 0 erstellt. Lässt sich das irgendwo ändern? I see now that ISPConfig 3.0.5.4p9 is available and proposed for upgrade. Can I proceed freely or should I make any specific manipulation ? The installer for the latest dkim-patch (1.1.10) supports ISPConfig p9. I install the plugin on both web server and mail server. Could you provide your OS and your PHP-Version? And on which server you see the debug-errors? Both directories must be owned by user and group amavis and the permissions are 750. I need to apply the patch on all servers, in a multiserver envoirment, or just on the mail server and ispconfig master? I have 1 webserver, 1 master Ispconfig control panel, 1 mail server. i`ve currently no time to check this by myself. i can do this in the next week. Thank you. What a brilliant piece of software. Mucho appreciado muchacho. do you know of a tutorial to implement the “other side” – I mean now I am signing all my outgoing emails with the proper DKIM but how would I check incoming emails for correct DKIm keys and take “action”? Congrats on the plugin, a really neat addition to ISPconfig. The installation was straightforward, but how can it be “safely” uninstalled ? You can revert the changes at every time. Just restore the created backups from postfix main.cf and master.cf and from your amavis-config. Hi, i’ve disabled amavis and spamassassin from ispconfig. Then installed the plugin, but ther’s an error that says “mail transport unavaiable” and can’t send any mails. So, i’ve renamed the master.cfdkim and main.cf.dkim to it’s original and now works again. is there any way to install without using amavis? No. The DKIM-Signing is done by amavis. first a big thanks for this patch! I have a server running web ad mail. On this server i have around 10 mail domain all signed with your DKIM patch ad all works perfectly. I have discovered , however, that one of these domains has not signed mail . Precisely this domain is the first level domain of the hostname of the server ( the server the hostname s1.example.com and the domain that give me problems is example.com ). I check the mail.log and mail.err but there are no errors. Could be the problem the domain ? Because with the remaining domains patch works perfectly! The command amavisd-new test keys example.com give me pass. Did you create a dkim-key for the domain that is not signed? I have not found the problem, but I found another one. ALTER TABLE `dns_rr` CHANGE `data` `data` TEXT NOT NULL DEFAULT ''; for your ispconfig-database. i will not update the installer to work without any issues on every setup. this is already done for the upcoming ispconfig-relase. I cant generate keys by clicking on “Generate DKIM private-key”. I have openssl on my server. What cound be wrong? Thank you. Did you disable exec in your webserver? Yes, I had. Exec is now enabled and this error a get after I enabled exec. I have Debian. Exec is enabled at CLI and CGI config. At Apache config is disabled. Should be enabled everywhere? I enabled exec everywhere, but I´m still getting this error when I want generate key by clicking on “Generate private DKIM key”. This is really neat. Works right outside the box. Thanks for the plugin and packaging! The guys at ispconfig should really integrate this into the core project. For testing / debugging purposes I suggest “dig TXT” on the CLI for the SPF record and “dig default._domainkey.yourdomain.tld TXT” for the DKIM record. I already integrate this to upcoming ispconfig-version. Could you help explain what needs to be done for “If you indicate that reports should be sent to an address outside your domain, you may need to request that the receiving party publish a special DMARC report DNS record” – I mean I would like to receive al DMARC reports at one specific email address that is outside the domains I am receiving reports for. is example.com the domain I am receiving reports for and thirdparty,com the domain I am receiving them at? If yes, I assume I need such a record in my receiving DNS for each domain I am receiving reports from? a bit of a stupid question but if I were to install this with git, WHERE would I do that, I mean cd to which directory before executing git clone … ? or does that not really matter and how would one update to a newer version in future also using git? It does not matte where you clone the git. /tmp might be a good solution. To update the git change to the cloned git-dir and run git pull. I don´t think that i will release any further versions of this patch as it´s already integrated into the upconfig ispconfig-release. Thanks Florian, do you have any links for me to check the progress of hte integration or where did you see that? Just want to check if it in the upcoming release or not, I don’t mind waiting a few more months to get this feature or do you think it will not be a problem using your patch now then upgrading when it gets integrated? You can use this patch with the current release. If you ugrade your installation to the upcoming release (3.1) you won´t loose any data. With ISPConfig 3.1 you don´t to install the DKIM-Patch. The full patch is already ispconfig 3.1. But its just a developer-version. You should not use it on a production server. Just install the patch and you´re fine. So on the 3.1 upgrade, should i install the patch again? Hi and first and foremost I want to thank you for your DKIM Patch. However, I have a bit of trouble to set up DKIM signing on the submission port. Could you give me a hint how I could archieve that? I’ve managed to get DKIM signing on submission by myself. at the end of the submission options. There is no need to add such an option and you shpould remove it. Make sure, that you have content_filter = amavis:[127.0.0.1]:10024 in the main.cf, 127.0.0.1:10025 inet n - n - - smtpd ... and 127.0.0.1:10027 inet n - n - - smtpd .... in master.cf and make sure, your smtpd_sender_restrictions are right. All these things are fullfilled – actually. However, I don’t want to decline that I may did a mistake, eventhough I can’t see it. btw why is the dedicated content_filter in the submission options wrong or not good? What’s the reason? Here are my main.cf and master.cf, if you say it DKIM on submission should kinda work “out of the box” and there must be a mistake, eh? Could you show your amavis-config, too? Did you see anything in your logs when you deliver mails on the submission-port? And: your mails are signed with dkim when you deliver them on port 25? For some resaon I couldn’t answer on your response, so do I on my own. To your question regarding DKIM signing on Port 25: Yes, with these configuration files amavis signs my emails on Port 25. I’ve removed the content_filter line in the master.cf within the submission options and amavis doesn’t sign anymore my emails with DKIM. However, I want to slowly “train” my email users to send their emails through port 587 for certain reasons, that’s why I need it working on Port 587 aswell. You have i.e. two policy_bank in your amavis-config. Are you running openSuSE? Amavis signs mails over 25 d 587 (you should have a signed-mail from me in your inbox). Ive installed the latest version of the patch on the latest ISP Config but just can;t get it to work. The tests i sent to @port25 and various other checkers all come back with Bad signature (Fail). The DNS record has been added and that DOES pass the external verifier checks as being valid. DNS is hosted externally. From that i assume it IS getting signed with something in amavisd-new. The keys have been generated via the GUI on ispconfig without issue and the storage directory is amavid readable and owned. Any idea where im going wrong with all this? If you use an external DNS please make sure, that the record is not to long and try it with a key-strength of 1024bits. You can run “amavisd-new showkeys” to see the full dns-record that must be inserted in the dns. You may had an error with cut&paste. As long as you do not provide the domain a selector i can not check your dns-record. Accoding to http://lists.amavis.org/pipermail/amavis-users/2011-September/000837.html your dns-record might be wrong. thanks for great patch! 🙂 It’s easy, super. Installation was no problem (only tells me “check the permissions manually (750 for amavis.amavis or vscan.vscan)”….what can I exactly do with it? ), but I have major problem with outgoing mails. There are not signed by DKIM…. I just try your debug-page, and “amavisd-new testkeys” wrote me, that “default._domainkey.mydomain.cz => public key: not available”. It’s because I have “external DNS records”, or does not matter on it? Because in external DNS-records I have correct TXT record with values copy from ISPConfig -> E-mail -> Domains -> specific domain -> DNS-record. I noticed here in this discussion, that text is only approximate, but my be I need it to know exactly. In “DNS-record field” is for example default_domainkey._mydomain.eu, in disscussion above tells that correctly it is default.domainkey.mydomain.eu, and amavisd-new tesstkeys tells default._domainkey.mydomain.eu. Any option from these dont function. I have ISPConfig 3.0.5.4p5, and your latest patch downloaded today. Debian 6.0.
amavisd-new testkeys checks your private-keys against the public-keys stored in a dns-record. If you use external dns, you should wait a few hours and/or use dig (i.e dig default._domainkey.schaal-it.com TXT or dig @ns03.schaal-24.de default._domainkey.schaal-it.com TXT) to query the dns from your domain-hoster for the public-key. amavsid-new shows the file containing the privat key and displays the dns-record for your dkim-key-pair. I try the DIG and find some mistake in my external DNS record (i made a copy of text “default._domainkey.exampledomain.com” to DNS, but in DNS must by only text “default._domainkey”, so basic mistake, I am sorry). So now I have correct external DNS record with DKIM key, and amavisd-new showkeys exampledomain.com shows me private key, too. But my OUTgoing mails has not signed by DKIM signature. I cannot find it in header of test mails. What am I doing wrong, or where is the problem? In “check the permissions manually (750 for amavis.amavis or vscan.vscan)” = message during installation? I am basicman in this system, what should I do? Set the permission od amavis folder? Or it is not the problem? Thanks you very much for you help! I just set permissions for /var/lib/amavis/dkim to 750, but my problem is without change. Do you have another idea? You can check your postfix-configs and amvis-config against the install.txt (manual setup). If you need further assist with this, please open a ticket at https://support.schaal-24.de/. And I found a little error in install.txt. The filename of amavis.conf.txt is amavis.conf.dkim. Problem solved. There was – for some reasons – /etc/amavisd.conf but amavis uses the /etc/amavisd/conf.d-structure. I wanted to share something that took me two hours today to figure out. I already had the 1.0 version of your dkim for ispconfig installed using the wget dkim-latest_ispconfig3.tar.gz some months ago (in september 2014). This time I used git clone https://git.schaal-24.de/ispconfig/dkim.git and afterwards in the tmp dir ran the install.php. I answered ‘y’ to every question. 2015/03/16 02:38:19 [error] 4422#0: *711934 "/usr/local/ispconfig/interface/web/index.php" is forbidden (13: Permission denied), client: 87.212.11.140, server: _, request: "GET / HTTP/1.1", host: ":8080"
2015/03/16 02:38:19 [error] 4422#0: *711934 open() "/usr/local/ispconfig/interface/web/favicon.ico" failed (13: Permission denied), client: 87.212.11.140, server: _, request: "GET /favicon.ico HTTP/1.1", host: ":8080"
for every of these dirs and every subdir they had that did have a setGuid and did not have the group execute rights. Is this caused by a small bug in your script or does it have something to do with my OS/server settings? The install.php should change owner and group for the interface-files to ispconfig.ispconfig. Why do the message is “not signed”, and which DNS record is expected ? Does that mean my config is not fully configured ? This plugin signs with dkim and not with a domainkey. Just check “DKIM check details:” inside the mail from port25. Awesome guide, this seems like a really easy thing to do so I’m going to give it a go myself. thanks for providing this topic and patch. customer was getting rejected by gmail such he could not email his customer list. download via ‘latest’, so I didn’t notice patch version. implement what didn’t get done with the php script. we did not do the ‘alter table’ as we for the moment are only doing 1024 keys and dkim / amavis / ispconfig 3 are working well. are thought is that if we update ispconfig 3/et al/ we didn’t want it to walk on this mod. maybe wrong thinking on our part, but lazy and it works as is. I don´t know why the installer shows you this warning, but you can safely alter the db-table dns_rr for keys > 1024. Hello, we have a problem with the patch (1.1.6) and ispconfig 3.0.5.4p5 . When we create a Domain key in the “mail domain” dialogue this looks fine. However, in the DNS dialogue, the key does not show up with its full length. The respective field seems to be too short. I read that there was a database change but I could not figure out if the install.php applies this by itself or if we need to alter the database. I should mention we hat a 0.7 version of the patch installed before this one. Or is this not database-related? We run a multiserver setup and installed the patch on the server running the ispconfig interface and on the mail server where also the DNS resides. Sry, I figured out that we needed to alter the dns_rr field to “text”; now it works as expected! Thank you for this plugin! Thanks for the great patch. I’ve installed it on my two ISPC 3.0.5.4p5 servers x.x.x.131 and x.x.x.134. I have DNS role installed only on 131. Whereas I intend to used your patch to add DKIM and SPF on 134 also. But it gives me error “DKIM disabled for this mail-domaindata_error_empty” when I try to add DKIM for an email domain which is serving from 134. Three times I reinstalled Debian 7 + ISPConfig system. I tried to install by DKIM-Patch. The latest version of an installer the bad can? I used the installer a few days ago and all changes are done. Could please provide your OS and the php-Version (feel free to send me a mail). You can not change a DKIM-Record in the DNS by editing the TXT-Record. You should use the DKIM-Button instead. Please also check your database-structure for dns_rr or run “ALTER TABLE `dns_rr` CHANGE `data` `data` TEXT NOT NULL DEFAULT ”;” for dbispconfig (console or phpmyadmin). It seems, that you had some trouble with the installer. My system Debian7-64 + nginx + (php5-fpm). I established according to the instruction of https://www.howtoforge.com/perfect-server-debian-wheezy-nginx-bind-dovecot-ispconfig-3. I now reinstall again system and I establish ISPconfig. May I send you to e-mail, root password that you could check installation of a DKIM Patch? => My system Debian7-64 + nginx + (php5-fpm). I established according to the instruction of https://www.howtoforge.com/perfect-server-debian-wheezy-nginx-bind-dovecot-ispconfig-3. P.S. I tried doing this via the git clone command. I’ll try again and do it manually, shouldn’t be a problem doing this, right? the tag_as_foreign.re tag_as_originating.re files are not being created/copied either. I will open a support ticket, I think that is the easiest. It would be awesome to fetch the server-instance-type (e.g. web/interface or mail) and then only ask for those changes which are really required to apply..
I´ve no flattr-account. Maybe you missed something with cut&paste? Could you send an email to mailtest @ unlocktheinbox.com and forward me the result? Sorry, I can’t add longer spf recor not even in a later time by editing record. You really need a spf-record longer than 255 chars? 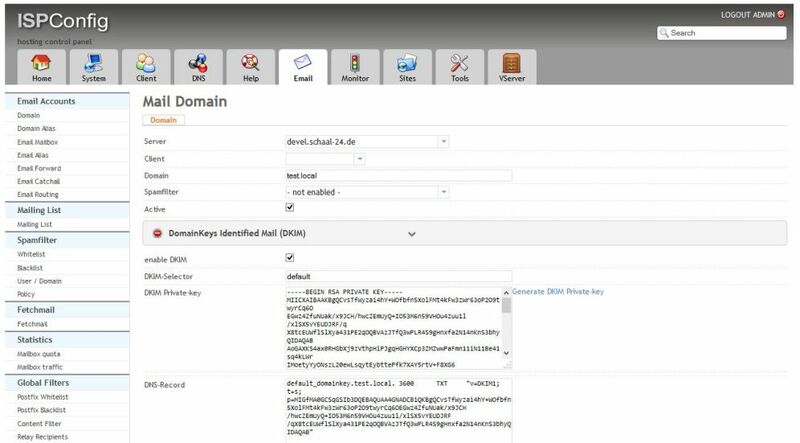 the dkim-dir is created as 750 if the user amavis or vscan was found. Otherwise its 755 to allow root to access the keys. I have installed your patch on my ISPConfig setup. I have a multi server installation with 2 servers, both running their own mail, web and mysql server. The first server is also running as a DNS server. When I use the resync tool to resync DKIM tokens, I get an error in the ISPCOnfig log that says “Unable to write DKIM settings – no or invalid DKIM-Path defined”. On both servers the path is set to “/var/lib/amavis/dkim” and that folder exists on both servers. What is this error and how can I fix it? Also antother quick question: I saw a small file named “dkim-patch-all-languages.tar.gz” in your files folder. The text left to the checbox in the resync tool is empty. Can I install this languages archive and will it fix this? Which language are you using? I checked it with the german and english-language and the resync-tools shows the values for every checkbox. The error is no longer occuring when I resync the keys, but the dkim path was right from the beginning. I din’t change anything. A little mysterious, but it’s working now. I’m using Dutch. Your question made me thinking and I added the language string for “resync_dkim_txt” in the nl_ language file for the resync page. Maybe you can adjust the install script that it adds the language string in all recync language files? The missing lng-files was not attended. 😉 It will a part of the next release. Yet the path is set and ISPCFG3 actually does manage to write as I did a ls -al /var/lib/amavis/dkim/ and I can see from the time stamp that it actually resynced the DKIM keys. Any ideas why I get the error emails yet the resync succeeds?? Nothing is missing, but we can’t edit a SPF record. So, if I add a spf record and I missed to check the active option, I can’t update it to active this record. The only solution is to delete the record and create a new one. Use the SPF-Button in the DNS-Zone. This loads your current settings and allows you to change anything you need – incl. activating the record. FYI: those records are simple TXT-Records. If you edit a TXT-Record you always get the interface to edit txt-records – even if some values are disabled. You can change the source to change a TXT-Record with spf-value. But this can break the record very easy. You can not change the spf-record (this is just an information about the current settings) but you can change everything in the other fields to update the record. 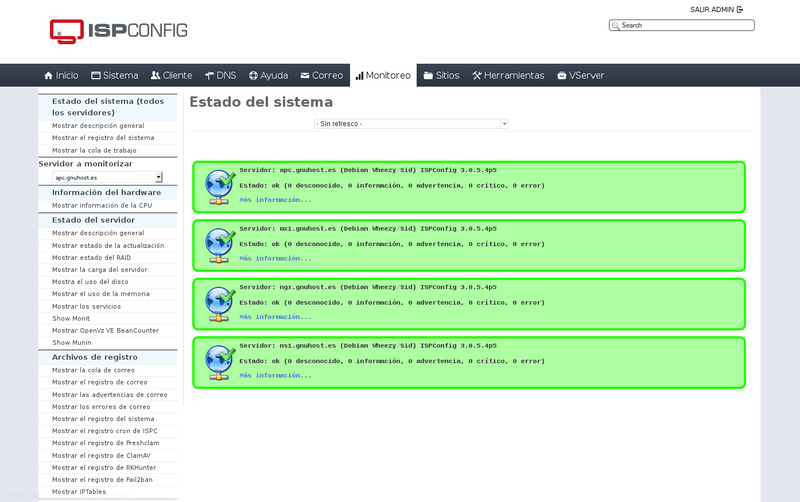 It´s possible to allow changes in the record itself but this will also allow custumers to change those settings. I don´t think that i will change the code to allow the admin to change the record-field in the spf-wizard with the current ispconfig-release, because the next major-release uses bootstrap. – when I try to add on SPF records, it seems the interface have an HTML issue, because ther is a “/>” next to the active checkbox. 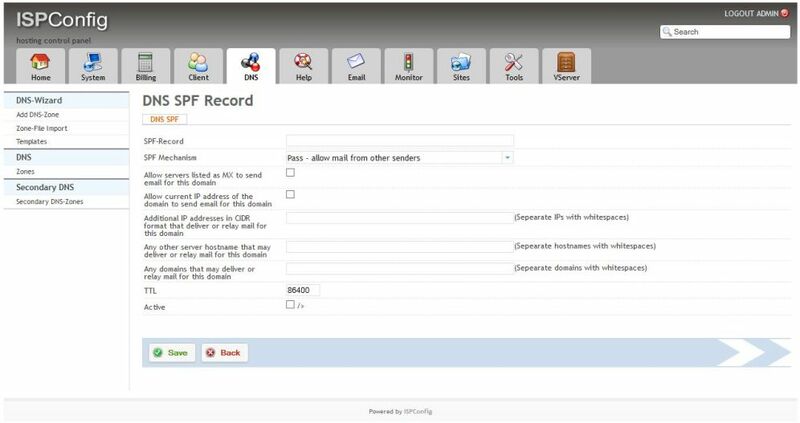 – If we want to customize a SPF record, after create one, the interface says “we can’t add SPF to TXT records”. I think we should have the ability to modify it if we want to. You can customize the SPF-Record with the new SPF-Button. If you need more settings please let me know what´s missing. If we allow SPF with a TXT-Record a customer may break-up his spf-record (and breaks mail-delivery). > when I try to add on SPF records, it seems the interface have an HTML issue, because ther is a “/>” next to the active checkbox. I actually fixed this, but how would I create a pull request? 😉 @Florian? One more thing, I think putting colon in backup filename is not a good idea. On my server, I can’t Tar the backup file generated. Suggested involvment: create the /var/lib/amavis/dkim directory, with appropriate rights, if it doesn’t exists, would be great. Your backup “fails” because the latest version was not installed. There is no colon in the backupname. The archive is just called dkim-date(%c).tgz. I will update the installer within the next days to avoid some errors, choose a different archiv-name and ask for some user-input. There will be also a release with some dmarc-related changes before x-mas. 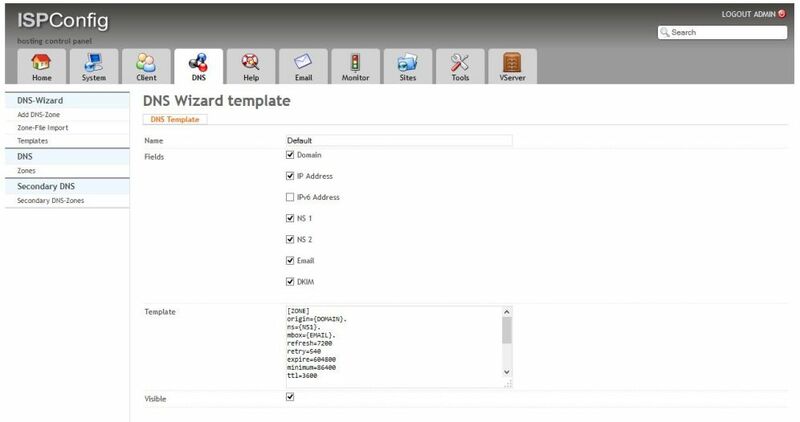 The installer could not create the dir for dkim-keys because you can change this in the backend and this may lead to unused directories plus you can have different users for amavis on different mailservers (vscan or amavis). If the directory does not exists when you create a dkim-key-pair, it will be created with the right permissions. If you have a master-server without mailhandling, you will never such a directory on this server. I have installed ispconfig and removed spamassassin and clamav. So i guess amavis is also not there. I did this to reduce the memory footprint. Spams are already blocked at postfix level through rbl and by csf blocking other public block lists. You need amavisd-new to sign the mails. You could remove clamav and spamassassin if you need no spam-checks. Hi, I just installed the latest version on Centos 7 yesterday but failed during /etc/init.d/postfix restart: command not found, setup aborted. Here are some of my postfix errors. Anyone can help me get my email sending and receiving working again? Thank you very much. I checked my config.inc.php and mysql user name and password were correct and same in mysql-virtual_domains.cf and the password are working properly. only postfix failed to work as you can see from my last post. It seems that postfix can´t connect to mysql with the user ispconfig. But what about “/etc/init.d/postfix restart: command not found”? Do you need “service postfix restart”? If you think, the install.php failed you can restore your configs from the archiv in /var/backup and install it manually (adjust amavis and postfix, copy the files and alter the database). I will try it on centos 7 next week. The dns-record is generated with the right settings. This bug affects only the dns-record in the mail-domain-settings and is display for information onyl. The dns-modul creates propper dns-settings. I just fixed it in the git and will release and new version within this week. is compatible multiserver enviroment ? Yes, the plugin is fully integrated in ISPConfig. You can run install.php on every server because an activated plugin will not be used if the server is neither a mail oder dns-server. Since there is a change in the database-structure to allow dkim-keys up to 4096 bytes, you should the patch on every server. This indicates, that the installer was not able to make backups of the postfix-configs and / or was not able to run postconf. Maybe you ran out of memory / diskspace? thanks for you great script ! I had the same issue than Fran and by checking the code of install.php i figured out the issue. I have a multi-server setup and I had to run the setup on both mail and web server (I hope that I didn’t miss one). On the mail server, no problem, the setup was successful. On the web (ispconfig main) server, it didn’t work because there is no amavis nor postfix installed. So I had to say ‘n’ when the prompt asked me for configuring postfix/amavis. This means that what ever you answer.. $answer will be set to ‘y’.. After correcting this I was able to install correctly the patch to my web server. Raphael Lienard figured out one important point – as I am also running a multi-server setup without amavi/postfix on the web-servers and was looking for the issue. On multiple places within the install.php the last condition always overwrites the $answer variable to yes. Hi, I’m going to install your patch on our master server tomorrow I just have a quick question. Is it required that I also install this patch on our clustered server as well? I guess you do but just wanted to make sure first. 2. You must activate the server-plugin on every mail-server. The easiest way is to run install.php on each server. 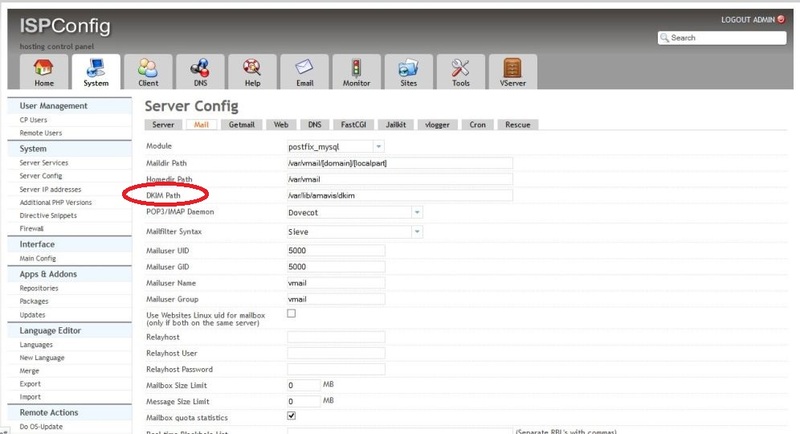 It makes no difference, if you change the ispconig/interface-dir on a slave-server and you can also activate the dkim-server-plugin on a web-server but it will not be used. Hi Florian, Thank you for this great patch. Installation of latest patch (v1) on my fresh Debian/ISPConfig-3.0.5.4p3 was smooth, but “Generate DKIM Private-key” doesn’t do anything. What did I missed? OpenSSL and OpenDKIM are installed. Path is set to /var/lib/amavis/dkim/ and it’s owned by amavis. Why did you use OpenDKIM? You should not use OpenDKIM and amavis to sign mails. Did you see nothing when click “create…”? In this case please check the error-log from your http-server. If you can´t see a dns-record but the key is created, you can ignore this (there is a bug regarding the dns-record when the domain-modul is in use, so you will never see the dns-record in the mail-domain-settings). I’m having the same problem as Rudi on my Debian 7/ISPConfig 3.0.5.4p8 server with external DNS. Install procedure went without any problem. DKIM path and strength are set at Server Config. The DKIM path is properly chmodded to 750. “Generate DKIM Private-key” does nothing and my apache2 error.log gets no new entry. After some fiddling I verified mail_domain_dkim_create.php came back with ‘invalid key’ for and an empty so I tried through a root session both openssl commands from this php file and both returned what look like proper results. Am I missing something? Thanks for any pointers. Do you have this problem with the latest version? Make sure, that you did not disable php-exec in apache. Brilliant! That’s it. I did disable php-exec. in lang spanish fail show server options. Thanks. It´s already fixed in the git. I have the option but it has no caption. When I install this patch I can’t access to ISPCONFIG server config, it keeps think for a couple of seconds and nothing happends. Can I install it over the previous patch or I have to undo the changes before apply this new patch? Now I can access to ISPCONFIG server config but i dont have the dkim path option. How can I define the dkim path now? Did you set the dkim-dir in the interface to /etc/postfix/dkim, too? This errors occurs, when ispconfig is unable to write anything to the amavis-config (60-dkim or amavisd.conf). Can you post the full path to your amavis-config? ISPConfig never writes to amavisd.confdkim. This is a backup from your old config created by the installer. Your amavis-config can´t be a symlink. Everything besides the installer 😉 works on centos 6.5 (i just installed centos). Please add the content from amavis.conf.dkim (from the archiv or git) manually to your amavis-config. You can also get the latest version frm git and run install.php again.